I Started cheering at 3 years old, so my life consisted of homework in the car, gymnastics, traveling, practice, competitions, making friends from all over the world, more practice and more competitions. 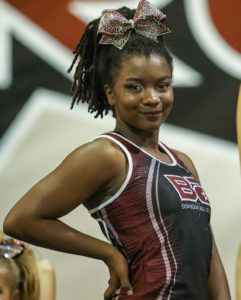 In the last few years, I’ve had the opportunity to model and promote the brands I wore and used for cheer, so I had the best of both worlds. However, my life got flipped turned upside down after a strenuous and toxic cheer season with all-star and high school that consisted of negativity and the feeling of just being taken advantage of. I had to make the hardest decision of my life which was to walk away from the thing that mattered the most in world to me. 2017 was quite possibly the hardest year of my life. I went from being the popular kid, although I was and still am homeschooled, and always having something to do, to being kind of nobody and having too much free time. It was hard and scary and I learned how powerful the mind is. I found out who my real friends are and who were just there to use me. A break is always great but there’s always a downside to it. I decided in 2018 that I would go back to cheer but change my outlook on life. I came back after a break and went down a level and it was so hard on my confidence and kind of feeling embarrassed. I got messages from people all over asking if I was going to leave my gym and that we should confront the coaches. Yes, we were upset and confused, but we trust that I was placed where I would thrive the most. We wanted to come back this year and be positive. We stayed with Senior 3, and it really helped me out. God always does things that you don’t understand at first but it’ll make sense later on. 2018 was the best year for me, I had friends that truly had my back and I grew better as a person. It was my selfish year. Now I’m more confident in not only who I am as a person but how I look on the outside because I’ve learned to not care what others think. So, if you need to take a break, take it and find a hobby because taking a break was the best thing for me and I love my life now and my team! Amazing young lady! Denae, you are not only an inspiration to young girls, but also to older women! It takes some of us many many years to figure out what you have already figured out at such a young age! Keep growing and learning, it only gets better as you continue to learn. I’m so proud of you and all you have accomplished!